Usually, I don't paint landscapes nor do I frame my paintings. 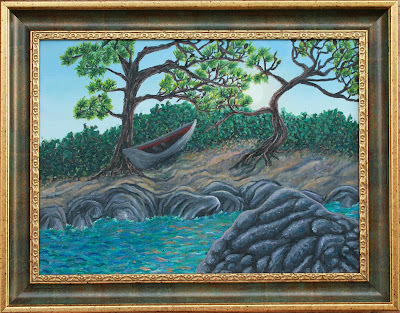 But this painting is different, because it is inspired by a place on the island of Thassos, which me and my family love. Another thing that makes this painting special is that it was a present for a special person - my father. The boat is sort of between journeys, the end of one is the beginning of another.